Station X has built the GenePool web platform for real time management, visualization, and understanding of clinical and genomic data at scale. As part of the GenePool analytics engine, R is used to calculate statistics that help scientists search for patterns in their genomic data. Scaling R using traditional methods has been challenging since GenePool calculates statistics for tens of thousands of genes, and millions of variants in real time. In this post, I walk you through the process of creating a Python AWS Lambda package that bundles R, show you how to execute Lambda via Amazon API Gateway, and explain how this serverless microservices architecture has enabled GenePool to scale R dynamically to analyze genomics data in real time. GenePool is an enterprise-level customizable and extensible platform for biomarker discovery, translational research, and clinical genomics. GenePool can be used to analyze all of the common genomic data types, including gene expression levels, sequence variations, copy number, and DNA methylation data. These analyses can be applied to both customer data and GenePool’s reference library, which includes The Cancer Genome Atlas (TCGA), among other large projects. GenePool is built upon AWS and is designed for storing, analyzing, and managing patient data in a HIPAA-compliant environment. To comply with HIPAA, Station X has signed a Business Associate Agreement (BAA) with AWS to ensure that protected health information (PHI) is adequately protected. Only the HIPAA-eligible services defined in the AWS BAA can be used to process, store, and transmit personally-identifiable patient data. AWS Lambda and Amazon API Gateway are not currently HIPAA-eligible services, so we implement a process to de-identify all data to be analyzed using our described workflow. To use these services, I’ll explain how PHI data is de-identified to maintain BAA compliance. GenePool provides a number of statistical analyses, one of which is the survival analysis. Survival analysis is a class of statistical methods that models the association of a variable with the time it takes for an event to occur, such as failure of a cancer patients’ response to therapeutic treatment. The most widely used statistical method for survival analysis is the Cox proportional-hazards regression model. We will show how GenePool uses the R function coxph to provide survival analysis statistics for every gene (~20k) in the genome, in order to calculate the significance of an association of a gene’s expression level with the time to outcome event. Calculating survival statistics on every gene is an example of an “embarrassingly parallel” problem. SparkR on Amazon EMR is one possible implementation solution, but Lambda provides significant advantages for GenePool in this use case: as scientists run analyses in GenePool, Lambda is able to scale up dynamically in real time and meet the spike in requests to calculate statistics on tens of thousands of genes, and millions of variants. In addition, you do not have to pay for idle compute time with Lambda and you do not have to manage servers. When executing Lambda functions, you have a choice of executing them directly, or using API Gateway. Station X chose API Gateway because it provides a REST API (our preferred approach for integration with services), has built in request throttling, and supports robust error handling via HTTP status codes. Using R in Lambda requires building a zip package that contains C shared libraries. You compile these on an Amazon Linux instance to ensure compatibility with the Lambda environment. You also write a Lambda handler in Python that dynamically loads the R shared libraries and interfaces with R via rpy2, a Python package. You then execute the function via API Gateway. All of this code is also available in the Lambda R Survival Statistics GitHub repository. To start, you need an instance running the same version of Amazon Linux as used by Lambda. You can find the AMI version listed in Lambda Execution Environment and Available Libraries. Because you are only using this instance to build the package for Lambda, a t2.micro is sufficient. After you have launched your instance, SSH into it. For more information, see Getting Started with Amazon EC2 Linux Instances. After you have connected to the instance, configure the AWS CLI with your security credentials. This is necessary because you will be copying the Lambda package to Amazon S3. For more information, see Configuring the AWS Command Line Interface. Now, execute the following commands to install everything required for R, Python, and rpy2. Next, use virtualenv to manage all of the Python dependencies, so that you can package them easily. After you create your virtual environment, install rpy2. You need all the shared libraries that were not already on the box before you installed R, plus liblapack (as we learned through trial and error). Use the following commands to add the libraries. You could copy all of $VIRTUAL_ENV/lib/python2.7/site-packages/ but for this walkthrough, take the essentials only. In $HOME/lambda, create a file called handler.py as shown below (as mentioned previously, this code is available on GitHub). You need to load all shared libraries and set the R environment variables before you can import rpy2. To optimize performance, the code has been designed so that each request can support the expression values of multiple genes. For example, to calculate the statistics for 20 K genes, we are able to make 100 requests each with 20 genes. This helps minimize latency by reducing the number of requests. Log messages to Amazon CloudWatch by using the Python logging module, which will add a timestamp for each log entry. As in step 1, start up a new EC2 t2.micro instance and SSH to it. As before, be sure to configure AWS CLI with your security credentials. Then unpack the Lambda package and set some R environment variables so you can test things. aws s3 cp s3://<your-s3-bucket>/lambda_r_survival.zip . Now test the handler by putting the following code in a new file called test_handler.py (this code is also available on GitHub). Michael Raposa recently wrote the Extracting Video Metadata using AWS Lambda and Mediainfo post which describes how to deploy a Lambda function. Follow the instructions in Step 4: Deploy the Lambda function. When configuring the Lambda function, specify the handler as handler.lambda_handler, set the memory to the maximum size of 1536 MB (greater memory allocation in Lambda is correlated with greater compute power), and set the timeout to 30s (the max for API Gateway). For more information about deploying Lambda functions, see Creating a Deployment Package (Python). For more information, see Make Synchronous Calls to Lambda Functions in the Amazon API Gateway Developer Guide. You may have noticed that if you encounter an error in the Lambda handler while calculating the statistics, it throws an exception with a custom error object serialized as a JSON string. In API Gateway, you will map this a 400 HTTP status code so that GenePool can handle this error, log it, and report a friendly message to the user that there was an error. Reporting a friendly error message is important since it enables GenePool to remind the researchers that they need to have a sufficient number of samples with events in order to calculate statistical significance. A recent post, Error Handling Patterns in Amazon API Gateway and AWS Lambda, explained how to map error strings to a HTTP status code, but you’ll go through the details for this specific string. Choose Method Response and add a 400 error. In the Post method, choose Integration Response , 400. For Selection pattern , enter . *”httpStatus”: 400,.*. For Content type , enter “application/json”. Finally Choose Save and re-deploy the API. To demonstrate a survival analysis, this walkthrough looks at the RNA-seq expression counts data from the breast cancer cohort of TCGA. There are 1218 patients in this cohort, and you will look at the 480 patients who have primary tumor samples, were diagnosed after 2009 (to ensure non-biased collection of samples from living and deceased patients), and have been monitored for recurrence of breast cancer. GenePool calculates the survival statistics on all 20k genes in the genome but for this post, you just look at the MKI67 and APOE genes. MKI67 is a known biomarker for breast cancer recurrence ( PMC3669503) and is one of the genes used in a commercial available diagnostic test that predicts the likelihood of breast cancer recurrence ( PMC3396611, PMC3669503). In contrast, APOE is unrelated to breast cancer and is instead linked to Alzheimer’s disease and cardiovascular disease. We expect MKI67 to have a significant p-value showing association to recurrence of breast cancer, and we expect APOE to not have a significant p-value. events – An outcome event indicating whether the patient had a recurrence of breast cancer (1=true, 0=has not had recurrence for the duration of the study). times – The number of days until recurrence of cancer (the event) occurs, or the number of days on the study without recurrence. values_by_record – A two dimensional array, where each row represents a gene’s normalized expression value in each patient. The first row represents MKI67 and the second row represents APOE. Execute the following curl command (the curl command is also available on GitHub as a shell script called testapigateway.sh). The first row in the response corresponds to the MKI67 gene, and the second row corresponds to the APOE gene. The p-value for MKI67 is 5.92E-3, indicating that the gene is significantly associated with recurrence of breast cancer. In addition, the hazard ratio is greater than 1 indicating a higher risk of recurrence. In contrast, as expected, APOE has an insignificant p-value and a hazard ratio close to 1. While this result is expected and confirms what is known in the literature, this example shows running analyses in GenePool, such as the survival analysis, can enable scientists to discover novel biomarkers predictive of survival. Lambda and API Gateway have enabled GenePool to calculate statistics in real time on all 20K genes in the genome, as well as millions of variants. When a user submits an analysis, GenePool’s Analytics Engine (running on Amazon EC2) queries the GenePool database to get the appropriate genomic data for the requested patient samples. It then creates a large number of threads in order to execute API Gateway concurrently at scale, then maps the statistics results back to the corresponding genes and variants specific to the scientist’s requested analysis. GenePool presents the results in the GenePool web UI. Here is an example of a GenePool visualization that plots the hazard ratio vs. the log of the p-value for all 20K genes. 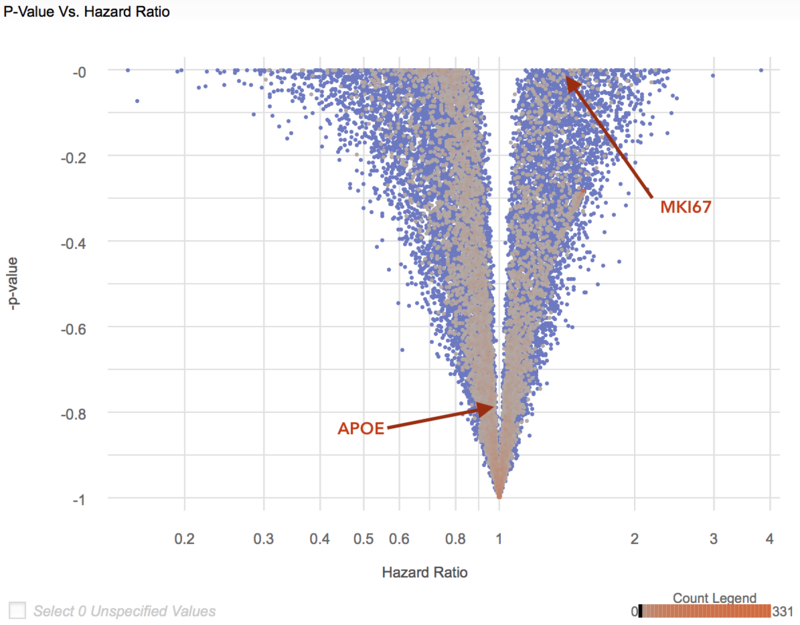 You can see that MKI67 has a higher hazard ratio and more significant p-value than APOE. When calculating the survival statistics on all 20K genes, GenePool concurrently submits 100 requests of 20 genes each to API Gateway and Lambda. Each request takes about 2 seconds to execute, meaning that the survival statistics are calculated on all 20K genes in 20 seconds. These performance numbers are impressive especially considering that by using Lambda and API Gateway, Station X does not have to pay for idle compute costs, does not have to manage servers, and can scale dynamically as scientists run analyses in GenePool. As a reminder, earlier in this post I mentioned that the AWS Business Associate Agreement (BAA) specifies that Lambda and API Gateway cannot be used to store and transmit PHI data. GenePool’s Analytics Engine is built on Amazon EC2 instances that are BAA compliant (Dedicated Instances, encrypted, etc. ), and these are the only servers that store and manage patient data. As you can see from above, when the Analytics Engine calls API Gateway, the patient data has been de-identified so that the patient name, ID, and sample ID are never transmitted. Instead, API Gateway and Lambda only receive the event, time-to-event, and expression values. As an extra precaution, GenePool never submits the gene name for the corresponding expression values. This ensures that we are able to use Lambda and API Gateway to calculate survival statistics while still complying with the AWS BAA and HIPAA. In this post, I showed you how to build a Python-based Lambda package that includes R and rpy2. I also showed how GenePool uses Lambda in conjunction with API Gateway to scale R dynamically and dramatically improve the performance of calculating survival analysis statistics in real time on large scale cohorts, while not having to manage servers or pay for idle costs. Finally, I demonstrated that calculating statistics at scale in real time in GenePool is enabling clinicians and researchers to identify key genes and variants associated with clinical outcomes, allowing them to monitor disease progression and discover new treatment options for patients. Thanks to Mia Champion, PhD , AWS Technical Business Development Manager, Scientific Computing who also contributed to this blog article.